Sounds good -- just emailed an inquiry -- thanks Mark! Mark,what is the price range? 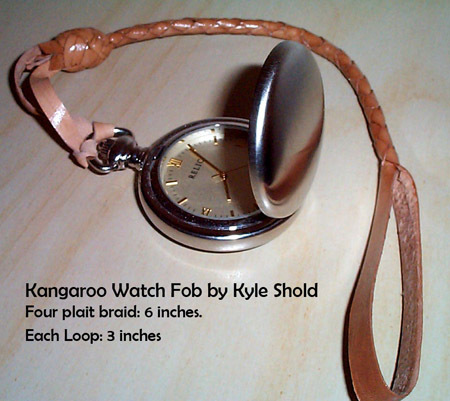 Just received the hand plaited leather watch fob that I ordered from Mr. Kyle Shold. It is well made and nice looking! I am going to use it daily and will report how well it holds up. I suspect that this should last a great while. Phil, is yours the 4 or 6 plait? Now that you've had it a while how do you like it? The one I purchased from Mr. Kyle Shold is the 6 plait variety. I have been wearing this item daily since Jan.14th 2004 and it is working exactly as advertised so far. It is very well made product that should last for a long time. I think the price is extremely reasonable for the quality, plus the fact that it is hand-made! I'll put it on my calendar to place an update to this topic in 6 months from now. Here is a copy of the original email that I received from Mr. Kyle Shold explaining his hand-made kangaroo leather lanyard. attaching to the belt loop and going into the watch pocket. Add $2.00 shipping for each lanyard ordered. Could you please a picture of yours when you get it? This is Mark's new 4 plait fob made by Kyle. Kyle has it attached to his watch for size comparison. Jim and others interested in the kangaroo leather lanyards. and here is his reply to me. voiced their concern know that I'm still available at this address. Thanks. Copy and paste this address to send off an email to Kyle to inqure about or order these kangaroo leather lanyards. I got three of these fobs from Kyle and they are very good quality and he turned them around quickly. 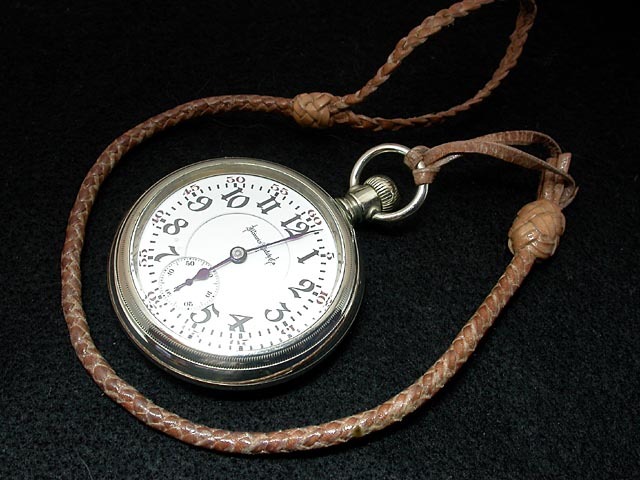 Thanks for letting me know about these and now all I need to do is buy two more pocket watches to go with the two extra ones I bought. I just got my second batch of fobs from Kyle. I followed Mark's lead and got the shorter ones. I asked if had any in black, but he did not. He did, however, say that he could work up something in a rich brown. I like it a lot! 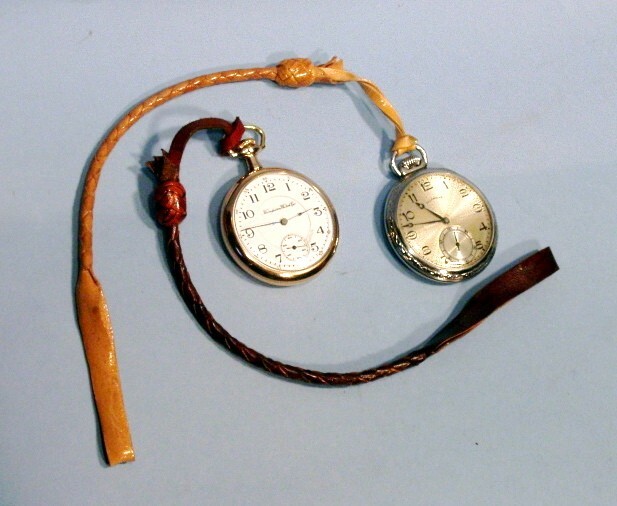 Lousey watch pictures, but you can see the important part, the fobs. I just received my three fobs today; (1) four strand, and (2) six strand. I like them alot, very high quality and a super price. I like the look of the traditional plain loop on each end, and concur that a six inch version is the best configuration. He told me he's had nothing but trouble with earthlink, hense the address change.